Anyone watching the starting rotation for the Red Sox this season has been holding their breath for various reasons. First, the loss of David Price caused concern with the hole left behind. Second, injuries depleted the bullpen and took Steven Wright off the field for the rest of the season with a knee injury. Drew Pomeranz started with forearm tightness, but was able to make his planned starts out of Spring Training. Finally, wondering who would stand up to fill the roles left open from the remaining rotation pieces. While Eduardo Rodriguez has been holding up his spot nicely, Pomeranz has been a disappointment through his first eight starts. 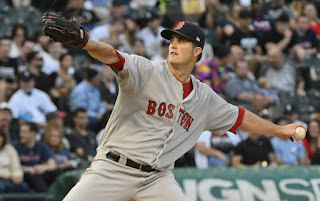 In his first eight starts this season Pomeranz was on average only able to complete just over four and a half innings, putting a major strain on the Red Sox bullpen. In that span he posted a 4.97 ERA, allowing opposing hitters a .267 AVG while allowing 40 hits, issuing 16 BB against 45 SO's. During this span Pomeranz all but abandoned his third pitch, the cutter, throwing it just three percent of the time because of the strain it put on his forearm. This has changed in his last two starts. 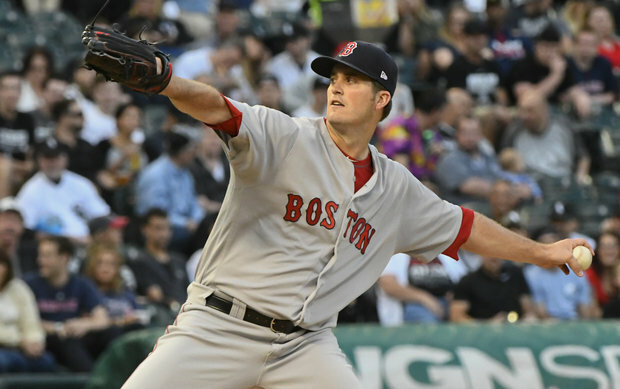 Pomeranz threw cutters 13 percent of the time against the White Sox, and that third pitch, along with an occasional changeup has been effective. His cutter adds complexity for hitters and makes the fastball and curveball much more overpowering. Wednesday against the White Sox Pomeranz created 16 swings-and-misses, the most of any start he had this season. This start combined with the last one against Texas on May 25 have been off the charts in comparison to the preceding eight starts. He's struck out 19 batters and issued only one walk and has an ERA of 2.08. Pitching coach Carl Willis knows his cutter is crucial to Pomeranz's success on the mound. "I think it was a fine line because of him trying to get physically ready to compete and not wanting to push that pitch," Willis said. "It's the last pitch in his arsenal, it's the newest pitch for him, and a pitch he felt maybe led to some of his problems with the forearm. "We talked about it a lot earlier in the year but it had to be a time where he was really comfortable using it," Willis said. "I think particularly you see him getting in counts and hitters are anticipating the curveball and he throws that cutter and it's definitely a surprise to them and it's really helping." Manager John Farrell did not mince words. Part of the problem was that Pomeranz would undo any bullpen work with five minutes of playing catch. Believe it or not, the flaws he was fixing in the bullpen came back in daily games of catch. His stride toward home too closed, Pomeranz struggled with fastball location and abandoned the cutter that leaked back over the plate. His triceps felt the strain of a longer arm path, causing him to leave a start early. Pomeranz now uses a cheat sheet to focus prior to playing catch. For example, on Tuesday he extended his throwing an extra five minutes after noticing he had slipped into some bad habits again. Don't look now, you just might see him checking his back pocket while on the mound someday soon. Nobody has a problem with that if Pomeranz can continue to keep the bullpen off their feet through seven innings.